Blossom the lovely stars, the forget-me-nots of the angels. 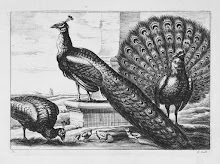 Although it is still August, Porcelains and Peacocks is very excited about the approach of September. 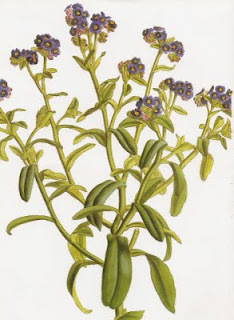 The flower for the month is the forget-me-not and the birthstone is the sapphire; both are blue, P & P's favorite color. Forget-me-nots have long been a symbol of true love and remembrance. A medieval legend tells the story of a knight strolling by a river with his lady. He stops to pick her a posy of small blue flowers but the weight of his armor causes him to fall into the water. As he is drowning he tosses the bouquet to his love saying, "Forget me not". 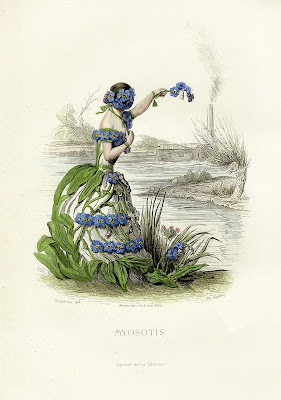 Jean Ignace Isidore Gérard (1803-1847) who is better known by the pseudonym of J. J. Grandville, depicts the forget-me- not in the guise of a woman tossing flowers into the river in the engraving from Les Fleurs Animées. Fellow Frenchman Louis-Aristide-Léon Constan (fl.1830's-1860's) shows a more academic approach to the flower in his chromolithograph Moyosotis azorica. Like the forget-me-not, the sapphire has symbolic associations. Its blue color is connected to the sky, heaven and angelic realm. An Art Nouveau brooch by Louis Zorra combines a cluster of sapphires with opal and pearl in an enamel and gold setting.